From the moment he stepped into the spotlight as a solo artist just over a decade ago, Puerto Rico’s Miguel Zenón has steadfastly refused to embrace a traditional career path. An ace alto saxophonist, enterprising composer and adroit arranger, he could have slipped comfortably into any of those roles. Zenón has, however, consistently sought to bring more to the game than repeating tried and true forms. He has moved through the stylistic landscape of jazz and Latin idioms like a bulldozer, radically transforming long-accepted stylistic norms. Such previous albums as Alma Adentro: The Puerto Rican Songbook, Esta Plena and Jibaro have reshaped perceptions of his island home’s culture. His vision has been rewarded by multiple Grammy nominations and fellowships conferred by both the MacArthur and Guggenheim foundations. Identities are Changeable (Miel Music) is another bold adventure. As much an experiment in cultural anthropology as an exercise in music-making, the eight-track program integrates fragments of interviews the saxophonist did with dozens of Boricuas in the greater New York City area. His quest to pinpoint characteristics of the constantly shifting Puerto Rican identity commences on “De Donde Vienes?” Framed by energetic big band riffs, Zenón asks Nuyoricans to state their name, where they were born and raised, and where their family is from. The responses quickly establish the project’s overriding theme -- that there is tremendous diversity in the Puerto Rican community. Each track explores a different theme, from “Second Generation Lullaby” to “My Home,” while the music cleverly shifts its focus to adapt to and help amplify the spirit of each new topic. 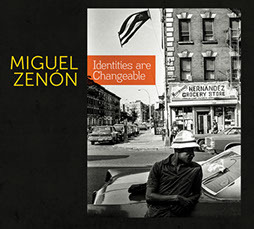 Zenón has once again reaffirmed his genius status. Another release that boasts its own strikingly singular personality is the bracing, multicultural outing Nora La Bella (Rebeliosa Music) by New York City-based Bolivian soprano Gian-Carla Tisera and an all-star ensemble. Strains of Latin American folk music, Nueva Canción, tropical Latin dance rhythms and opera converge into a bubbly, exotic whole that redefines the concept of World Music. Tisera sings in Spanish, English, Italian and the indigenous Quechua tongue of her homeland. Cuban pianist Elio Villafranca and Argentine trumpeter Diego Urcola shine in this eclectic setting, and the program serves up many surprises. The evocative “Señora Chichera” has a sultry Afro-Peruvian flair about it before evolving into an outburst of festive fervor that would be right at home in a remote Andean village. The title tune, co-penned by the vocalist and Villfranca, begins with opera-like formality before exploding into an up-tempo, salsa-style excursion. Although she sometimes flirts with kitschy Yma Sumac-style warbling, on the whole Tisera and company deliver some of the most original sounds heard in years. Venezuelan singer and songwriter Eliana Cuevas impresses in both roles on Espejo (Alma Records), a stylistically-diverse survey of Pan-American idioms that effectively blends contemporary pop balladry with rhythmic traditions of the region. Today a resident of Toronto, Cuevas has quickly captivated this cosmopolitan metropolis’ legion of Latin music aficionados with tunes like “Estrellita.” The song’s urgent, bouncy tropical vibe reflects a Miami Sound Machine-style of Latin pop. “En un Pedacito de Corazón,” a slow cooker that finds the singer in a contemplative mood, has Cuevas injecting a hint of Shakira-style sexiness in her vocal delivery. “Agua, Cangrejo y Sal” ushers in a horn section to bolster the arrangement’s funk and blues-rooted essence and emphasize yet another aspect of Cuevas’ multifaceted talents. Even among the rainbow of distinctive cultures sprinkled throughout the Caribbean Basin, the Garifuna stand out. These descendants of breakaway slaves today inhabit islands and Caribbean coastal areas of Nicaragua, Honduras and Belize. The Garifuna still speak their own particular dialect, a mixture of West African, Arawak and Carib linguistic traditions. The music created in these small, isolated communities is equally unique, as guitarist, vocalist and composer Aurelio demonstrates on Lándini (Real World). The Honduran musician leads an ensemble that includes a bevy of percussionists, guitarists and singers. An electric guitar, often cast in a 1950s rockabilly mode, complete with wah-wah pedal effects, is the primary accompanying instrument. Even if not one word of the vocalizing can be interpreted, these rustic, sunny sounds radiate a mesmerizing quality that proves hard to resist.